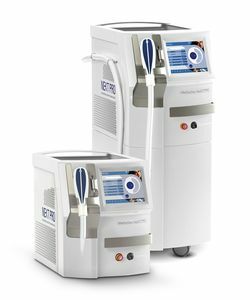 The High Power Diode Lasers of the MeDioStar NeXT Family, represent state of the art technology for permanent hair reduction treatments. The wavelengths of the MeDioStar NeXT devices were chosen in such a way that the absorption of the light is very high in melanin, but low in water (important substance in the skin), therefore providing for a very selective and safe treatment, with very low risk of side effects. At the same time, this makes it possible to treat even dark skin types (up to skin type VI) with very low risk of hypopigmentation. In addition, a special treatment mode (SmoothPulse) can be used for larger areas, which makes the laser pulse sensation almost unnoticeable, even for sensitive patients. Due to the optimum design of the MeDioStar NeXT lasers, side effects of more than slight redness and swelling around dark hair are very rare.